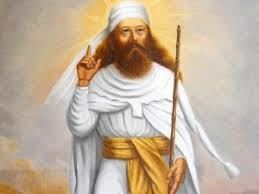 Zoroastrians (or Zarathushtrians) are the followers of a visionary messenger named Zarathushtra who lived in Iran over 1000 years before Christ. His 200,000 or so followers are scattered throughout the world, the largest numbers remaining in Iran and India. The Greater Toronto Area has the largest population of Zarathushtrians in North America, approximately 5000 in number. When was Asho Zarathushtra born? No one knows for sure. Dates fixed by different scholars range between 6000 BC to 630 BC. But does it really matter to us when he was born? Isn't it enough to know that he lived and revealed one of the most enlightened guidelines for human behaviour? Why do we call him Asho Zarathushtra Spitama? Asho is a title of respect derived from the Avestan word Asha meaning righteousness. Zarathushtra, meaning "one possessing a golden-coloured camel," was his given name. Spitama was the family name. Very little is known about him. You have to remember that the era was prehistoric, writing, as we know it today, hadn't been invented. What is definitely known and universally accepted is that he was born to Dughdova and Pourushaspa in Aryana Vaeja (land of the Aryans i.e. Central Asia). At the age of twenty years, he went to Mount Ushidaren to meditate. After ten years of self-study, he received the revelation that there is only one universal source of wisdom Ahura Mazda, and that the aim of human life is to strive to be reunited with Him. It took Asho Zarathushtra many years of struggle before the superstitious and gods-fearing people accepted his word. And this acceptance happened largely through the support and patronage of Kai Vishtasp, the ruler at that time, and his consort Hutaosa. Nothing has been stated, directly or indirectly, about Asho Zarathushtra passing away, leading one to believe that it must have been through natural causes. Thousands of years later, dramatic embellishments were added to the story of Asho Zarathushtra's life. This includes the saga of Durasobrab's attempts on the life of baby Zarathushtra and his miraculous escapes; Zarathsuhtra's confrontation with the jealous sorcerers at Kai Vishtasp's courts; and his murder in the temple by Turi Bradosh. Will Zarathushtra be resurrected as a Saviour at the end of time? In Persian mythology, three saoshyant (those who bring benefit) will appear, one every millennium after Zarathushtra's death. Each will be born of a virgin miraculously impregnated with Zarathushtra's "seed" while bathing in Lake Kansaoya (geographical location unknown). 1) Ukhshyat-ereta - he who makes righteousness grow. 2) Ukhshyat-nemah - he who makes reverence grow. 3) Astvat-ereta - he who embodies righteousness. The term saoshyant relayed by Zarathushtra in the Gathas is unrelated to these mythical men. He spoke of a man who will lead the world on a "Path that leads up to the World of Truth" (Yasna 43.3). However, whether this is interpreted as one particular man, or as each righteous human being who seeks out the path of Asha is up to individual belief. I believe that it is up to all human beings to work individually, but as a collective force, to "save" the universe, both at a physical and at a spiritual level. The word saoshyant, is sometimes said to be saviours in a superhero sense, but if you go back to the original meaning "one who brings benefit" then any benefactor of humanity in any field of human endeavour can possibly be a saoshyant.